Kids Crafts : She sticks crayons on a pumpkin and all the children in the neighborhood want to do the same! She sticks crayons on a pumpkin and all the children in the neighborhood want to do the same! You will even need a dryer! And you will see that the result is worth it! Halloween is coming, so this article is perfect for you and your children! 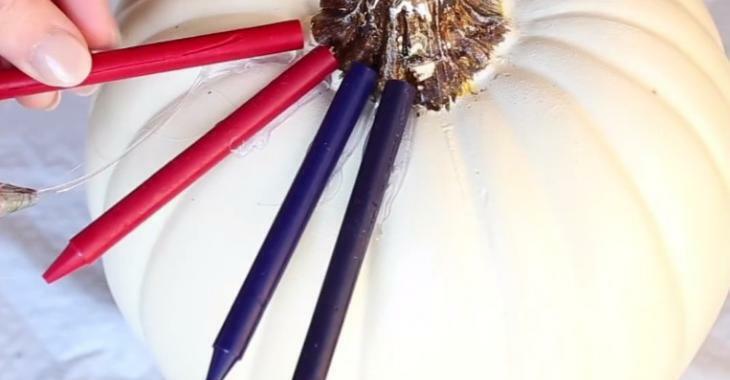 This mom has found a simple and colorful method to decorate a pumpkin without having to cut or dig it. Just use some white paint and crayons of your favorite colors. You will also need a hot glue gun and a hairdryer. The pumpkin galaxy is wonderful! What will you try at home?